This publication is one of four reference volumes published annually by the Higher Education Statistics Agency (HESA). HESA is a company limited by guarantee, and is owned by the United Kingdom (UK) higher education sector through the representative bodies Universities UK and GuildHE. HESA collects data from publicly-funded higher education institutions (HEIs) in the UK on behalf of funding bodies and government departments, in a framework underpinned by legislation. This volume draws on HESA’s collection of data about students in HEIs during the academic year 2008/09, that is, the period 1 August 2008 to 31 July 2009. It covers data supplied by 165 HEIs (131 in England, 11 in Wales, 19 in Scotland, 4 in Northern Ireland); one of the English HEIs, The University of Buckingham, is a non-publicly-funded institution voluntarily providing data to HESA. The data collection procedure is uniform across all institutions, regardless of size, nature and location; the range of data fields collected is administration-dependent to a limited extent. HESA does not collect data from further education colleges (FECs). Data on HE provision in FECs is accordingly not included in this volume except for students funded indirectly through HEIs, in which case it is reported by the HEI through which funding passes. The other reference volumes published by HESA are as follows. Resources of Higher Education Institutions. This volume brings together information about the finances and the staff of HEIs. Tabulations are included which record and analyse income and expenditure, and the characteristics of staff, at the institutional level. Destinations of Leavers from Higher Education. This volume draws on the Destinations of Leavers from HE (DLHE) survey and provides information about patterns of employment and further study or training at a point about six months after completion. DLHE covers leavers from part-time as well as full-time programmes. Higher Education Statistics for the United Kingdom. This is the only HESA reference volume that currently falls within the National Statistics framework and it accordingly carries the National Statistics logo as well as that of HESA. It provides an overview of higher education in the UK from a statistical perspective, including statistics about applications, participation, institutional finance, staffing, student awards and loans. To achieve this broad coverage, this volume draws on data collected by other bodies as well as HESA, and in particular includes some information about directly funded HE provision in FECs. HESA also publishes annually two Statistical First Releases within the National Statistics framework. Detailed data for institutional planning purposes is published on CD (HE Planning Plus and HE Finance Plus). The HESA Information Provision Service exists to meet more specialist needs of data users on a bespoke basis. The Higher Education Information Database for Institutions (heidi) commenced operation in April 2007, and offers a subscription service to institutions and approved HE bodies to allow the interrogation of HESA and other data through the production and export of tabular reports and their display as charts. Commencing with the 2002/03 cycle of publications, HESA reference volumes now comprise a relatively slim printed volume containing only a limited range of tables, together with a CD, which contains all the remaining data familiar to users from earlier years, supplemented with additional and more detailed tables. The tables on the CD are in Microsoft® Excel 2003 format. This has the further benefit of allowing users to select data from the tables and manipulate how it is displayed. However, arithmetical manipulations should be carried out with caution because of the effect of the rounding applied to counts of students (see Definitions under ‘Rounding strategy’ for details of this). The full set of students included in the HESA data collection is adjusted to produce the HESA Standard Registration Population (SRP), for example by the exclusion of students of ‘dormant’ (inactive) status during the entire reporting year. A detailed account of the SRP may be found in the Definitions section of this volume. The SRP forms the basis for HESA reporting of student data. From 2007/08 onwards, the definition of the SRP was changed to exclude two further subsets of students. One of these subsets is very small, around 40 in total in 2008/09 spread across many institutions, and comprises students intermitting for a year to serve as sabbatical officers of student unions; their exclusion from the SRP has no material impact on statistical analysis or year-on-year comparisons, even at the institutional level. The other excluded subset comprises students returned as ‘writing-up’. These are largely graduate students whose programmes of study have been completed, but whose theses or dissertations are still in preparation. The exclusion of these students brings the SRP more closely into line with funding and fee arrangements, and in general produces a better measure of activity levels in institutions. However, the number of writing-up students is substantial, 46,340 in 2008/09, and the validity of some year-on-year comparisons depends on making an appropriate adjustment to allow for the change in definition. Regardless of their previous mode of study, sabbaticals and writing-up students were included with part-time students when totals were disaggregated by mode of study for years prior to 2007/08. So year-on-year comparisons involving only full-time students are valid without adjustment, but where part-time numbers or totals across both modes are compared adjustment is necessary. Appendix A provides a fuller analysis of the impact of the change, with tables to show its effect disaggregated by level of study and by administration. This commentary draws attention to some of the headline figures and key points that emerge from the main tables and those in the Introduction. The information is displayed graphically where appropriate. Where figures for previous years are quoted for comparison, they are taken from the 2007/08 and 2006/07 editions of this volume, except for ‘starred’ figures which have been adjusted by applying the new SRP definition to data for those years. Unstarred figures are not affected by the change in the SRP definition. 2,396,050 students were recorded as following an HE programme leading to a qualification or credit at a UK higher education institution in 2008/09 (2,306,105 in 2007/08; 2,304,700* in 2006/07). This total includes both full-time and part-time students. It includes students at further education colleges who were funded indirectly through an HEI; they have been counted within the numbers for that HEI. It excludes students studying on a directly funded HE programme at an FEC and excludes students studying at HE level in institutions that are not publicly-funded, apart from The University of Buckingham. In what follows, the terms ‘total’ or ‘entire’ HE population do not imply inclusion of these groups. Of the 2008/09 total, 64.3% (64.2%; 63.0%*) were following a full-time or sandwich programme and the remaining 35.7% were following a part-time programme. Except where they are separated out explicitly in what follows, the full-time category includes sandwich students. Of the 2008/09 total, 77.6% (78.0%; 78.2%*) were studying for an undergraduate qualification (either at or below first degree level) and the balance for a qualification at postgraduate level. Full-time first degree students made up 47.9% (48.1%; 47.1%*) of the HE student population. There were exceptionally high proportions of part-time students in combined and education. Women made up 56.9% (57.1%; 57.5%*) of the entire HE student population and 58.7% (58.9%; 59.2%*) of UK domiciled2 undergraduates. Subject areas with a high proportion of women included subjects allied to medicine (80.8%), veterinary science (76.0%), education (75.6%) and languages (67.5%). Subject areas with a high proportion of men included engineering & technology (83.9%), computer science (81.3%) and architecture, building & planning (68.9%). There were 368,970 (341,790; 325,985*) students from countries other than the UK, of which 305,885 were full-time and 63,085 were part-time. Such students represented 15.4% (14.8%; 14.1%*) of the entire HE student population, and the full-time non-UK students represented 19.9% of the full-time HE student population. Students from outside the EU numbered 251,310 (229,640; 220,575*), which represented 10.5% of the entire HE student population. Students from outside the UK were well represented in engineering & technology, business & administrative studies, computer science, law and mathematical sciences. Students from outside the UK made up 55.5% (53.6%; 51.5%) of all full-time postgraduates, with 44.0% coming from outside the EU. Students on sandwich programmes made up 6.2% (6.5%; 6.5%*) of all undergraduates. They formed the highest proportion of all undergraduate students in computer science, architecture, building & planning, business & administrative studies, agriculture & related subjects and engineering & technology. 21.2% (20.7%; 21.0%) of UK domiciled entrants on full-time first degree courses were aged 21 and over. 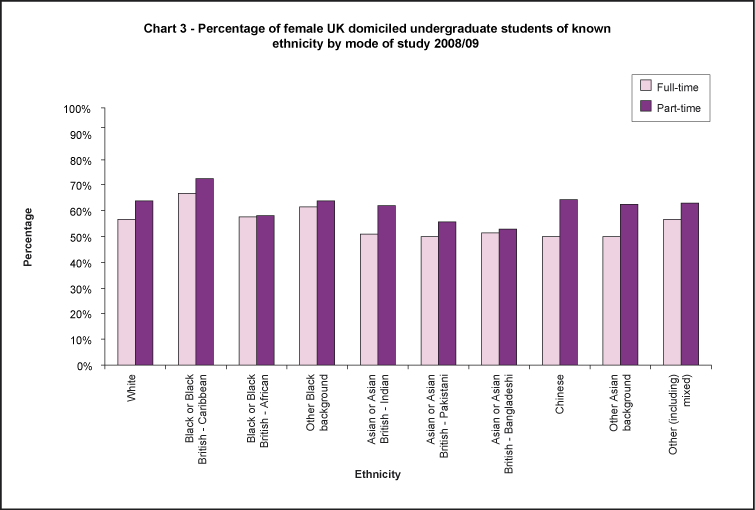 Ethnic minorities constituted 17.6% (17.0%; 16.4%) of all first-year UK domiciled HE students of known ethnicity. 18,850 (14,975; 11,633) foundation degrees were awarded. Of students who obtained a classified first degree, 62.1% (61.4%; 60.2%) were awarded first or upper second class honours and 14.0% (13.3%; 12.6%) were awarded first class honours. 95.3% of full-time first degree students domiciled in England studied in their country of domicile; the corresponding figure for Wales was 67.6%, for Scotland 94.4% and for Northern Ireland 69.2%. In addition to students studying at UK HEIs, there were 388,135 HE-level students studying entirely outside the UK, but either registered with a UK HEI or registered with a partner organisation and working towards a qualification awarded by a UK HEI. Of these ‘offshore students‘, 82.8% were studying outside the EU, with over 20,000 in each of Hong Kong (Special Administrative Region of China) and Pakistan, and over 40,000 in Singapore and Malaysia. Slightly more than half (50.8%) of all offshore students were studying at overseas partner organisations, with a further 29.0% studying by distance learning. In 2008/09 there were 2.47 million students studying for a qualification or for credit at 165 higher education institutions in the United Kingdom. Of these, 2.8% (69,135) were studying at further education level.3 Information about numbers of FE students studying in HEIs is included as the penultimate line of Table A (below) and in two of the main tables of this volume (Tables 0 and 0b), but they are otherwise excluded from the figures presented here and all percentages from this point onwards relate to students at HE level only. In this table 0, 1, 2 are rounded to 0. All other numbers are rounded up or down to the nearest multiple of 5. Percentages are not subject to rounding. # see relevant footnote in Notes to tables. Of the 2,396,050 HE students recorded, 64.3% were following a full-time or sandwich programme and the balance were following a part-time programme. Of the 536,810 postgraduate students, 17.5% were studying for a research degree and 57.1% for a taught higher degree. Of the 1,859,240 undergraduates, 72.7% were studying for a first degree. Of the remaining undergraduate students, 3.9% (72,135) were studying for a foundation degree. There were 28,665 students studying for a Postgraduate Certificate in Education (or Professional Graduate Diploma in Education), which is a fully postgraduate qualification reported within the ‘Other postgraduate’ category. There were 7,105 students studying for a Professional Graduate Certificate in Education, which is postgraduate in time but undergraduate in level and is reported within the ‘Other undergraduate’ category. Prior to 2007/08, what are now these two separate qualifications were included within ‘Postgraduate Certificate in Education’ (abbreviated as PGCE) and reported within the ‘Other postgraduate’ category. Table B provides a summary of students by domicile and gender. In 2008/09, 84.6% (85.2% in 2007/08) of all HE students were domiciled within the United Kingdom. Students from countries within the European Union (EU) accounted for a further 4.9% (unchanged from 2007/08). 10.5% of students (251,310) were from countries outside the European Union, up slightly from 10.0% (229,640) in 2007/08. Among students from outside the EU, by far the largest proportion came from Asia (60.0% of non-EU domiciles and 6.3% of all HE students). The next highest proportions were from Africa (14.0% of non-EU domiciles) and North America (9.8% of non-EU domiciles). Referring to Table 6a in the main section of this volume, we see that the countries within those regions from which the highest numbers of students come to study in the UK are, in Asia, China with 47,035 students (excluding Hong Kong, Taiwan and Macao), India with 34,065 and Malaysia with 12,695. In Africa, Nigeria with 14,380, with Ghana, Kenya and Libya each contributing over 2,000 students. In North America, the United States comprises the largest proportion with 14,345 students, followed by Canada with 5,350. With regard to mode of study, overall proportions of non-UK students studying part-time are very much lower than those studying full-time, particularly among non-EU students. Only 4.4% of part-time students were from countries outside the EU, compared with 13.9% of full-time students. Women made up 56.9% of the entire HE student population, being in the majority among both full-time (54.4%) and part-time (61.4%) students. The pattern was different between UK students, of whom 58.7% were women, and students from outside the UK, where the proportion of women was 47.2% overall. The proportion of females among UK domiciled students was higher than that of students from any other geographical region, with North America and Other European Economic Area students only slightly lower at 58.3% and 57.6% respectively. The lowest proportions of women were observed among students from Africa (40.0%) and the Middle East (31.0%). Table C provides a more detailed breakdown of the postgraduate population. Students from outside the UK made up 34.2% of all postgraduates and 55.5% of all full-time postgraduates, with 44.0% of full-time postgraduates coming from outside the EU (79.3% of the non-UK total). Non-UK students were prominent on full-time research degree programmes (50.2%) and even more so on full-time taught higher degree programmes (67.8%). Women made up 53.7% of the entire postgraduate population and 58.7% of UK domiciled postgraduates. There were considerable variations apparent in a breakdown by both type of programme and domicile, as shown by Chart 2. 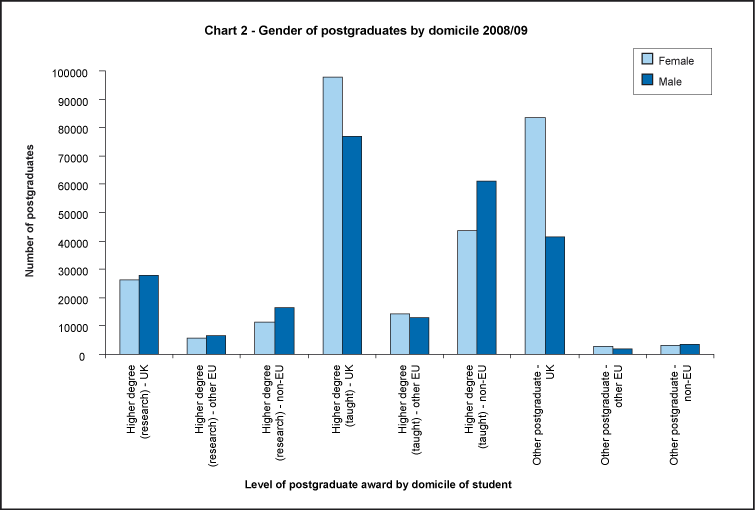 A major component of ‘Other postgraduate’ numbers arose from Postgraduate Certificate in Education programmes, where women are predominant and the large majority of students are UK domiciled, and this has contributed to the high proportion (65.8%) of women among students on ‘Other postgraduate’ programmes. For taught higher degree programmes the gender balance was close to even with 50.7% women, and for research degree programmes the proportion of women was less than half at 46.1%. Breaking down the research degree programme figures by domicile shows that among students from EU countries including the UK, the proportion of women was 48.2%, whereas it was 41.1% for those from outside the EU. Table D provides the same breakdown by domicile as Table C, but for undergraduates. The pattern at undergraduate level was very different from that for postgraduates. Only 10.0% of undergraduates were from outside the UK, comprising 3.9% from other EU countries and 6.0% from non-EU countries. However, undergraduates made up a larger proportion of students from other EU countries at 62.4%, than for non-EU countries where the figure was 44.7%. Of UK domiciled undergraduates, 58.7% were women. The figure for other EU countries was 54.0% and for non-EU countries it was slightly lower at 47.6%. The proportion of women on ‘Other undergraduate’ programmes, that is, aiming for qualifications which are predominantly below degree level, was 64.8%; this figure did not vary much between full-time programmes (65.4%) and part-time programmes (64.6%); student numbers on part-time programmes constituted 75.3% of all those on programmes below first degree level. Subject of study is an important factor in explaining the high proportion of women on programmes below first degree level, as illustrated in the following section. Table E shows the percentages of students at different levels who were following programmes in each of 19 subject areas, supplemented with the figures for four further areas cutting across or lying within the main areas. A detailed explanation of the main and supplementary subject areas, and the way in which student numbers are apportioned between them, may be found in the definitions section of this volume. Percentages are not subject to rounding. (1) Numbers reported under 'Supplementary subject information' are within and not additional to the overall total, but are disaggregated from it on a different pattern from the 19 subject areas. Most of the figures in this table speak for themselves, but there are two figures at the ‘Other undergraduate’ level that need comment, those for subjects allied to medicine and combined. The high proportion in Subjects allied to medicine was because it is still the case that a qualification below first degree level is the norm in many health-related professions, at least as an initial qualification aim. By far the largest component is that attributable to nursing, which attracts a large majority of women students. Many Open University students, who do not, at least initially, have to declare an award intention, are reported as studying for institutional credit in the combined subject area. Table F shows that the proportion of part-time students varied greatly by subject area. 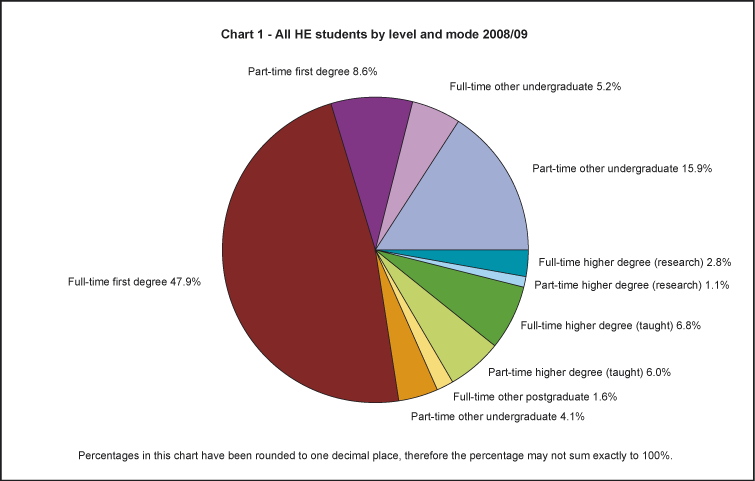 At 95.8% almost all students in the combined subject area were part-time; again, this is attributable to the way Open University students are reported. The other area with a very high proportion was education, at 61.0%. Similarly, the proportion of women students was heavily subject-dependent, with wide divergence from the overall figure of 56.9%. Subject areas with a high proportion of women included subjects allied to medicine (80.8%), veterinary science (76.0%), education (75.6%) and languages (67.5%). Subject areas with a low proportion of women included architecture, building & planning (31.1%), computer science (18.7%) and engineering & technology (16.1%). Table G shows the expected length of the programme of study reported for full-time first degree students who commenced studying in 2008/09. Overall 68.9% of these students were on programmes of up to three years’ duration. There were considerable variations between subjects, with programmes longer than four years being associated mainly with professional training in veterinary science and medicine & dentistry, and to a much smaller extent in engineering & technology and architecture, building & planning. Four year programmes are common across a wide range of subjects, and 27.2% of students were on such programmes; some but by no means all of these were sandwich programmes and these are discussed in more detail in the next section. Long programmes may have been slightly under-reported in Table G because of the possibility that, say, what is really a five year programme of study could have been reported as a three year basic programme followed by a two year professional programme. In most breakdowns by mode of study, sandwich students are included with full-time students. Students on sandwich programmes comprised 6.2% of all undergraduates. Table H shows by subject area the numbers broken down by first degree and other undergraduate levels and the overall proportion within the area. There was some sandwich programme provision in all subject areas except veterinary science and medicine & dentistry, but with very small numbers in historical & philosophical studies, education and the combined subject area. These are subjects where, traditionally, any practical training tends not to be structured on the sandwich pattern. Sandwich students formed the highest proportion of undergraduate students in computer science, architecture, building & planning, business & administrative studies, agriculture & related subjects and engineering & technology. Table Ii shows the proportion of first-year UK domiciled undergraduates in each age group. 21.2% of UK domiciled entrants on full-time first degree courses and 58.9% on full-time other undergraduate courses were aged 21 and over. 58.0% of part-time first degree entrants were aged 30 or over. Table Iii provides equivalent information for postgraduates. Ethnicity is recorded using the categories available for the 2001 Census (details can be found in the Definitions section). These categories are then amalgamated following Office for National Statistics guidelines into the smaller number of categories shown in Chart 3 and in main tables. The scheme is designed to describe patterns of ethnicity within the UK domiciled population; information on ethnicity is required by HESA only for students of UK domicile. Ethnicity is known for 95.2% of UK domiciled first-year undergraduates and 93.8% of UK domiciled first-year postgraduates. Taking first-year and continuing students together, it is known for 96.3% of undergraduates and 93.1% of postgraduates (from Table 10a). Participation in HE by students from ethnic minorities continues to increase overall and accordingly the most up-to-date picture is obtained from consideration of the position for new entrants. 17.6% (17.0% in 2007/08) of first-year students of known ethnicity are from ethnic minorities and for full-time first degree students the figure is 21.3% (20.4% in 2007/08). All figures in this paragraph are derived from Table 10b. There are substantial differences in gender participation across ethnic categories and this is also dependent on mode of study. Chart 3 displays these effects jointly. In 2008/09 a total of 674,415 qualifications were awarded at HE level to students in publicly-funded HEIs (together with The University of Buckingham) or on indirectly funded HE programmes in FECs. Of these, 30.3% were at postgraduate level, 49.5% were undergraduate first degree qualifications and 20.2% were other undergraduate qualifications. 18,850 foundation degrees were awarded, 2.8% of the total. Table K provides a more detailed breakdown. 20.7% of all HE qualifications were awarded to non-UK domiciled students. This figure rose to 55.0% of all taught higher degrees awarded. Of students who obtained a classified first degree, 14.0% were awarded first class honours and 62.1% were awarded either first or upper second class honours. 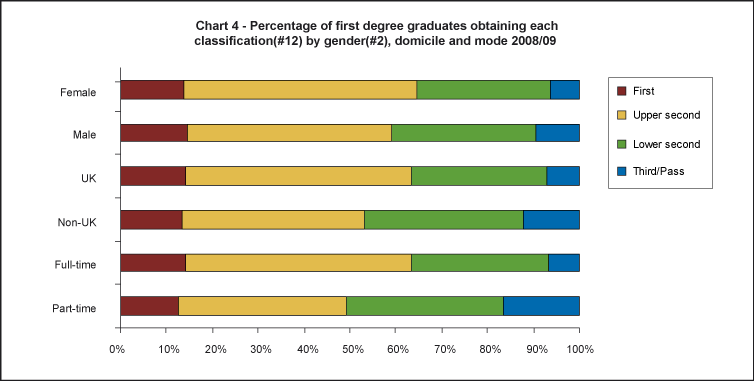 Chart 4 shows the female/male, full-time/part-time and UK/non-UK percentages drawn from Table L. The proportion of first class honours did not depend heavily on any of these factors, but the proportion of upper second class honours was substantially greater for female students than for male students, and similarly for UK students compared to non-UK students and for full-time students compared to part-time students. Table M shows that there is considerable variation by subject area in the proportions of different classes of degrees that are awarded. This table excludes the clinical subject areas medicine & dentistry and veterinary science, in which the majority of degrees awarded are not subject to classification. The female/male, full-time/part-time and UK/non-UK proportions vary greatly across subject areas (see Table F), and because of this it is not meaningful to interpret small differences from population proportions of degree classes (for example, in the proportion of first class honours) without adjusting for subject choice. The main tables provide figures showing student mobility within the UK for all UK domiciled students. However, the figures for postgraduate students should be interpreted with caution because the domicile will often reflect the location of undergraduate study rather than the original ‘domestic’ domicile. Part-time students display little mobility. It is accordingly of interest to focus on full-time undergraduates and these figures are presented in Table N.
95.3% of full-time first degree students domiciled in England studied in their country of domicile; the corresponding figures for the other UK home nations were 67.6% for Wales, 94.4% for Scotland and 69.2% for Northern Ireland. So English and Scottish students displayed little mobility in proportionate terms, but English numbers were large enough in absolute terms to mean that outwards mobility from England contributed almost half of Welsh numbers and more than one-eighth of those in Scotland. Outwards mobility from Wales and Scotland was almost entirely to England and two-thirds of outwards mobility from Northern Ireland was to England, with almost all the balance to Scotland. Within England, again for full-time first degree students, the flow into London was 51,295 and the flow out of London was 66,205, not greatly different in absolute terms, which means that there was proportionately much more mobility out of London to other regions of England (41.5% of the London total) than in the reverse direction (7.8% of the total for other regions of England). The table in the main body of the volume provides a full breakdown of mobility between English regions. There was less mobility between all but one of the administrations at the level of full-time ‘Other undergraduate’ programmes than at the first degree level: the corresponding percentages for study in the country of domicile were 99.1% for England, 77.1% for Wales and 95.0% for Scotland. The equivalent figure of 38.2% for Northern Ireland at first appears anomalous when compared to the other administrations and the figure of 63.8% for the previous year. However, the number of such students in Northern Ireland is relatively low in absolute terms and this results in greater scope for percentage fluctuations from year to year. In addition it is known that one of the largest groups of other undergraduate students within Northern Ireland institutions are nursing and midwifery students. This group has reduced in size markedly between 2007/08 and 2008/09 as the qualification route into the profession changes from undergraduate diploma to first degree. ‘Offshore provision’ is the term used to describe study taking place entirely outside the UK. However, where the students either are registered at a UK HEI, or are registered with a partner organisation in the country of study but are working towards a qualification awarded by a UK HEI,4 such students are termed ‘offshore students’. It is thought that the volume of offshore provision has substantially increased in recent years but quantitative evidence has not been available. Up to and including 2006/07, data on offshore students was collected at the individual level through the HESA student data collection using a simplified record structure (a ‘reduced record’), but submission of this part of the collection was optional for institutions and it was known from other evidence that the reported total of just under 80,000 offshore students greatly underestimated the total level of activity. Because of this, HESA did not include material on offshore provision in the student volume prior to 2007/08. One outcome of the review of the student record for 2007/08 onwards was the discontinuation of the use of a reduced record for offshore students, since that level of detail was not required. A separate aggregate collection was designed to obtain the required data. Government departments in the four administrations then decided that the financial and reputational significance of offshore provision to UK HEIs individually, and to the UK HE system as a whole, meant that for policy purposes it was necessary to have full coverage; to achieve this they decided to use their powers under legislation to make that aggregate collection mandatory. In consequence, from 2007/08 it was possible to publish information on offshore provision. (1) Students who are not registered at a UK HEI. Table O provides a breakdown by level of study and by the nature of the relationship with the student, and is disaggregated between EU and non-EU provision. It is clear when comparing these data in 2008/09 with the equivalent data for 2007/08 that very significant differences exist, particularly with regard to student numbers at partner organisations both within and outside the EU. This evidence, together with anecdotal evidence obtained during the data collection process, suggests that this level of change does not reflect a change in the level of provision since 2007/08 but is a result of improving data capture processes within HE institutions. As noted above, prior to 2007/08 there was no systematic and centralised collection of data on students studying entirely outside the UK and indeed the data held internally by HE institutions on such students had been of variable quality and coverage. The introduction of a mandatory HESA collection has required robust data capture processes to be put in place and such processes can take time to become fully effective. Therefore the information on offshore students must be treated with some caution until the collection can be shown to have reached an appropriate level of stability. In 2008/09 there were no FE-level offshore students studying within the EU and only 170 outside it. All subsequent analysis relates to HE-level offshore students only, of which 17.2% (66,815) were studying within the EU and 82.8% (321,155) outside it, amounting to a total of 387,965 students. Within the EU, the largest numbers of students were registered with a UK HEI (59.3%). Distance learning appeared to be the most common form of relationship for these students, accounting for almost two-thirds (65.7%) of the group. The number of students at overseas campuses within the EU was relatively small at only 410 students. Overseas partnership arrangements, in which students are not registered at, but are studying for awards of, a UK HEI accounted for 40.7% of EU offshore students. With regard to level of study, the majority of EU offshore students were studying at first degree level (64.2%), mainly through distance learning and partnership arrangements, particularly those where the students are not registered at the UK HEI. There were also sizeable numbers studying on taught postgraduate courses (29.2%). Outside the EU the pattern was slightly different, with the majority of students studying for an award of, but not registered with, a UK HEI (52.9% of non-EU offshore students), most of these at overseas partner organisations. Of those students who were registered with a UK HEI 57.1% were studying by distance learning. Overseas campus arrangements were more common for non-EU than EU offshore students, with 6.2% of non-EU students falling into this category. Referring to level of study, the vast majority of non-EU offshore students were studying first degrees (80.6%), with by far the largest concentration in overseas partner organisations (63.0% of all non-EU first degree offshore students). Table P shows the breakdown by level of study for the 20 countries with the greatest level of offshore provision. Almost three-quarters (73.0%) of all offshore provision was concentrated within these countries. The largest numbers of students were observed within Malaysia, Singapore, Pakistan and Hong Kong (Special Administrative Region of China), which between them accounted for one-third of all offshore students. Only three EU countries appeared within the top 20: Ireland, Greece and Germany. 1 These figures do not include students on directly funded foundation degree programmes at FECs, so are not a measure of the total uptake of foundation degree programmes. 2 Except where Guernsey, Jersey and Isle of Man students have been separated out explicitly, they have been included in UK figures. 3 This number is lower than in preceding years because some of the most heavily ‘mixed-economy’ HEIs in England no longer report their FE student numbers through HESA. 4 The University of Wales (central functions) has no students within the UK and so does not appear in this volume except in respect of its offshore students.